A total solar eclipse occurred on May 29, 1919. With the duration of totality at maximum eclipse of 6 minutes 51 seconds, it was the longest solar eclipse since May 27, 1416. A longer total solar eclipse would later occur on June 8, 1937. It was visible throughout most of South America and Africa as a partial eclipse. Totality occurred through a narrow path across southeastern Peru, northern Chile, central Bolivia and Brazil after sunrise, across the Atlantic Ocean and into south central Africa, covering southern Liberia, southern French West Africa (the part now belonging to Ivory Coast), southwestern tip of British Gold Coast (now Ghana), Príncipe Island in Portuguese São Tomé and Príncipe, southern Spanish Guinea (now Equatorial Guinea), French Equatorial Africa (the parts now belonging to Gabon and R. Congo, including Libreville), Belgian Congo (now DR Congo), northeastern Northern Rhodesia (now Zambia), northern tip of Nyasaland (now Malawi), German East Africa (now belonging to Tanzania) and northeastern Portuguese Mozambique (now Mozambique), ending near sunset in eastern Africa. Total solar eclipse of May 29, 1919, as emulated by Celestia. Albert Einstein's prediction of the bending of light by the gravity of the Sun, one of the components of his general theory of relativity, can be tested during a solar eclipse, when stars with apparent position near the sun become visible. Following an unsuccessful attempt to validate this prediction during the Solar eclipse of June 8, 1918, two expeditions were made to measure positions of stars during this eclipse. The first was led by Sir Frank Watson Dyson and Sir Arthur Eddington to the island of Principe (off the west coast of Africa), the second by Andrew Claude de la Cherois Crommelin and Charles Rundle Davidson to Sobral in Brazil. The stars that both expeditions observed were in the constellation Taurus. ^ Espenak, Fred. "Total Solar Eclipses with Durations Exceeding 07m 00s: -3999 to 6000". NASA Eclipse Web Site. ^ Ethan Siegel, "America's Previous Coast-To-Coast Eclipse Almost Proved Einstein Right", Forbes, Aug 4, 2017. Retrieved August 4, 2017. ^ Longair, Malcolm (2015-04-13). "Bending space–time: a commentary on Dyson, Eddington and Davidson (1920) 'A determination of the deflection of light by the Sun9s gravitational field'". Phil. Trans. R. Soc. A. 373 (2039): 20140287. Bibcode:2015RSPTA.37340287L. doi:10.1098/rsta.2014.0287. ISSN 1364-503X. PMC 4360090. PMID 25750149. 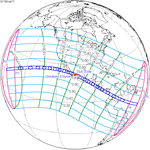 Wikimedia Commons has media related to Solar eclipse of 1919 May 29.